Remember to measure your pet for the paw-fect fit. Give your furry friend something to throw on in cooler weather with the Gooby Stretch Fleece Dog & Cat Vest. Made from an ultra-soft fleece, it’s perfect for everyday use, and is comfortable enough for your dog or cat to enjoy wearing all day long. 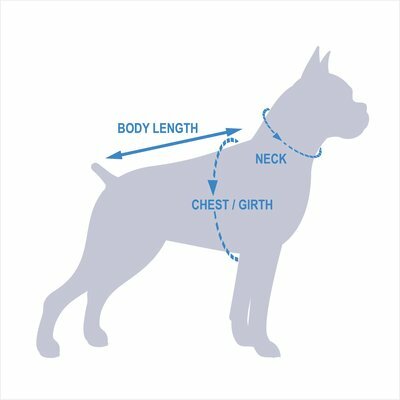 The stretchable material makes it super easy to put on and take off, and it can easily fit over collars and harnesses so that he can wear it outside during walks. And because fashion is second only to function, it comes in a variety of colors that complement every type of coat. Fleece dog vest is perfect for protecting your dog or cat from the cold weather. Stretchable material is easy to wear and pull-over design allows for easy on/off. Ultra-comfortable design can be worn all day long, and allows total freedom of movement. Available in a range of sizes to fit pets from 4 to 80 pounds. Please note: This product is designed and recommended for smaller dogs under 30 lbs. Large sizes don't necessarily mean it will fit a large breed dog. All Gooby apparel is machine washable. We recommend washing them in cold water and air drying. I have two toys poodles ( see my review on the non strecth fleecy from the same manufacturer for more info on size .I ordered medium. Because of the little strecth added to the fabric, you will have a more fitted look and potentially more free movement. Very well made. Nice color. My dogs have same lenght but different girth, see how they were the same size on the pictures. I also appreciate the non strecth fleecy for convenience of no harness required, but ordered large to compensate. We bought the biggest size and used the size chart, it’s a little big but not so big that we would return it. She has never needed clothes so she’s not used to wearing anything but we are going to CO and needed something. She seems to love it. I’ve bought four colors now our 10-lb Bichpoo. Very easy to put on. Durable but very soft. I’d wear it myself the quality is so great. What I really like is that they add comfort and light cozy warmth, but are also classy and sporty and cute at the same time. They wash up easy with your regular laundry or a quick hand way. Our dog loves them! My dog is 25 pounds, Rat terrier mix. I got the XXLG and the sweater is just a bit too big for her. Because it is so easy to put on, and covers her from neck to tail, I would spend the money and buy the XLG. A little pricey, hoping there will be a clearance sale soon. Warm, soft and easy to put on! Our golden doodle got groomed and had to be shorn pretty short! With all this cold weather we needed something to keep her warm until her regular curly coat grows back in. So easy to put on, she dives her head through the neck and raises her paws to be put through the arm holes. Fits perfectly and isn’t too warm. I got a 4XL for my 55 lb female pitbull. It fit her PERFECTLY. I will say, she is a bit slimmer than a normal pitbull, has more of a lean body shape and not very stocky. We were traveling to Michigan for the holidays and this was perfect for her. Covered her entire torso right down to the base of her tail. It's fleece, so it stretches a bit if you need it to. Overall a great product! looks nice longer because it doesn't pile. My cheenie loves this shirt. It fits him like a thunder shirt, ie. glove. I had trouble getting the right size. My chihuahua pug mix couldn't get his head thru a medium.and then the large was too big. The shirts wash up nicely and the colors are nice.